Will the tangled thicket of luxuriant vegetation overcome all barriers and engulf the big-eyed, colorful dolls and what they stand for? As a metaphor, jungle often refers to situations that are unruly or lawless. Or, as in Kipling's Jungle Book, is jungle a symbol for the intricate code of laws that rule human society? We have chosen still another possible meaning juxtaposing two different but complementary forms of life: life of nature and life of the Spirit. Both deserve attention and care. Conservation and preservation of bio zones is key to the life of nature. Forests have a global "climate-buffering capacity." A similar conservation and preservation applies to the life-giving message of the Nativity. Only a balanced and healthy spiritual ecosystem will be able to restrain and overcome the law of the jungle. 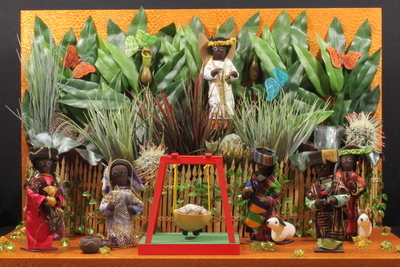 This African cloth nativity designed and sewn by Joana Lekia Nelson, a former art teacher, combines traditional costumes and unique African fabrics. Joana teaches girls seamstress skills. The girls assist in making the nativity dolls. 8 piece cloth doll nativity set, handsewn in Ghana by artist Joana Lekia Nelson. Set depicts Mary, Joseph, and Jesus in a calabash gourd manger, shepherd with attached sheep, an angel with gold cardboard wings, and three wise men with gifts. Exhibition label written by Father Johann G. Roten, S.M. originally for exhibition entitled "African Symphony" held at Roesch Library, University of Dayton.